Animated Film Reviews: Cool Zoetrope Animation, "Galloping"
3D Zoetrope from Kelly Egan on Vimeo. Kelly Egan created this galloping zoetrope for a recent event. Its not some big video game or anything, but it is cool nonetheless. The beauty lies in the simplicity of the process and the eternal nature of the subject. A zoetrope is nothing new in animation. They were popular 100 years ago. It is created by showing a sequence of still images that, shown with proper timing, create the illusion of motion by an otherwise stationary group of objects. It is related to those little flip books you may have gotten from a Cracker Jack box once upon a time, where you flip the pages and see a little story take place (and that, too, is an art form that survives and that we've shown on here before). A zoetrope typically is done with a cylinder with slits cut into it and a moving set of objects inside. Another way, used here, is with (apparently) a strobe light and perfectly calibrated movement on a turntable by a set of horse models. It's not easy to set up, but once it is, it creates a wonderful art form that is distinct from any other. The whole galloping horses thing was a big topic in the late 19th century - it took clever photographer Eadweard Muybridge on June 15, 1878 to solve a burning queston of the day: do horses ever have all four hooves at the same time? While that may seem obvious now, it wasn't considered that way back then. Muybridge was tasked with solving this issue. In the process, he created something special - the first silent film, though it wasn't viewed that way at the time. Considering that this was before Thomas Edison and his cohorts came out with the first real motion pictures, that is some feat. 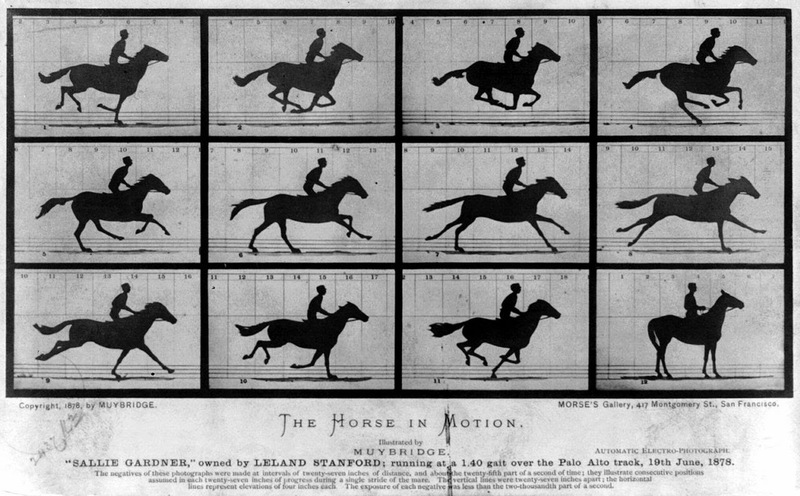 Muybridge ended that issue once and for all by taking perfectly timed shots to prove to a skeptical audience that all four hooves were off the ground at the same time. Considering that was a time when virtually all local land transportation was by horse, that told people something completely new about things they dealt with on a daily basis but still didn't completely understand. Just shows the value that this kind of thing can have. Oh, and he wasn't working for some rube who should have known better - Muybridge was commissioned to do this at some expense by none other than Leland Stanford, the founder of Stanford University. Below are nice vines from Anna Kaziunas France showing closer shots. This is a 3D Zoetrope I created for Makerfaire 2014. The horses were modeled and animated in Blender and then each frame printed on a 3D printer. 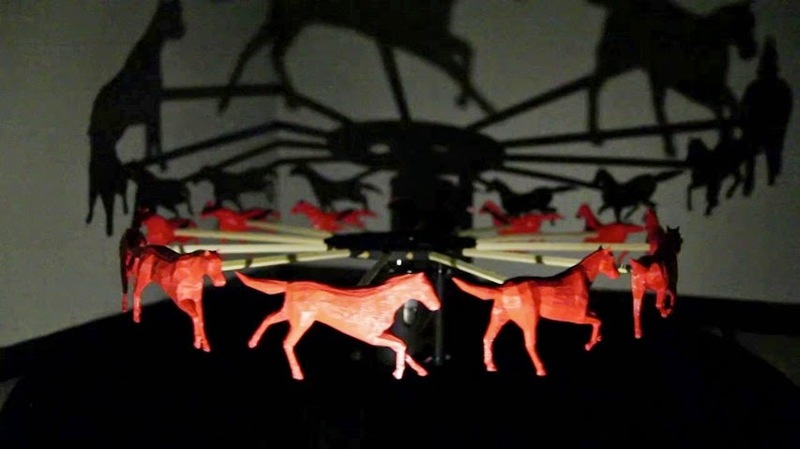 The animation occurs when the spinning horses are synced with a strobe. There is some flicker in the video because of the difference in the framerate of the strobe and the video camera.